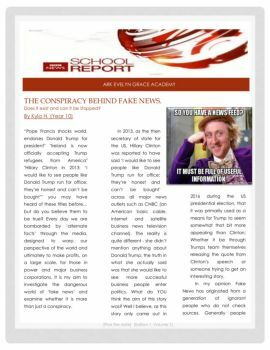 Students from Ark Evelyn Grace Academy are making the news for real - Thursday 16th March 2017! Kyla, Tioluwani, Rebecca and Remmel (Year 10), took part in this year's BBC's News School Report. After months of hard work and preparation, this team of intellectual and creative individuals covered 'Modern Day Slavery', 'The conspiracy behind Fake News' and the celebration of Women - 'International Women's Day'. A special thank you goes to Mr Howells (Media Studies Teacher and Deputy Vice Principal), Mrs Ekhator (Marketing and Communications) and Ms Edwards (Librarian) for their support to our students throughout this process. Thank you to all our interviewees also: Mr Hanson (Principal), Ms Manlay (Assistant Principal), Ms Hamilton (Deputy Head of Year 8), Ms Preston (Deputy Head of Year 7), Ms Simmonds (Assistant Principal and Acting Head of KS4) and Ms Carneiro (Head of SENCO). To open and introduce this year's school news report below is a short clip designed by our Producer and Editor Rebecca Wells, who used the 'Draw my Life' technique - Enjoy! "I enjoyed editing and researching different ideas in filming, production and editing. From this experience I hope to work on more projects like this, where I can experiment with different techniques and grow in my production, filming and editing skills. If I could do anything differently, it would be to spend more time on filming and editing, but overall this was an enjoyable experience!" EGA student reporters got their first taste of journalism when they attended the first ever International Conference on Modern Slavery and Human Trafficking at St Mary’s University in West London. In preparation for Tioluwani's report, our talented and aspiring Year 10 reporters watched and heard important delegates from the UK government, the Roman Catholic Church and European Union as well as key lectures from representatives of countries such as Nigeria and Algeria speak on the topic of Modern Day Slavery and how they intend to work with Prime Minister Theresa May to address this very present issue. They were the only secondary students in attendance – reporting the speeches of people like Home Secretary Amber Rudd. Our students were professional and represented the Academy really well. "I believe the BBC News School Report was very beneficial as it made me more involved in understanding the problems we as a society are facing today, when it comes to Modern Day Slavery. I have learnt how i can be a solution. I feel through this report I have made an impact by educating others about this issue and hope it spurs change. I have thoroughly enjoyed working with my friends on this project and Mrs Ekhator. I especially enjoyed visiting St Mary's University and interviewing Dr Carole Murphy. It was a wonderful experience." Our student reporters had the likes of Josie Verghese from the BBC and PC Joshua Edwards to encourage, advise and give them journalistic guidance to ensure their stories where factual, something of interest and something that could make a difference. They were able to ask advice on their particular subject areas, for example Kyla was able to speak with Josie and find out what her thoughts were on Fake news and how it has impacted her as a journalist. Remmel was able to ask PC Edwards questions about equality especially in an industry that is very male dominated. Having such an opportunity, our students where truly inspired and learnt a lot more about the subject areas for their reports. "I believe the BBC report was very beneficial as it made me more involved in real life and everyday problems that are happening. Through this opportunity, I was able to be a solution by bringing awareness to something like 'Fake News' and how much it really does affect peoples lives. If I could do anything different for my report, I would like to interview people who have been affected by 'Fake News' and tell their story."